A day of heavy rain has meant that the last of the bushfires [^] that raged across the state for five weeks is now controlled. The fires have claimed 210 lives, more than 2,000 homes and burnt 421,000 hectares. Two weeks ago we drove up to the farm, along the Melba Highway. On the way we passed close to the Kinglake township and through Yea, some of the areas most effected by the fires. The change in the landscape is almost unbelieveable; stark burnt trees and bare earth have replaced the lush, overgrown forest floor. From the highway there are signs of frantic fire-fighting efforts, especially around Glenburn, and around odd farmhouses. But, the human-scale of the loss, lives and houses, is hidden from view. 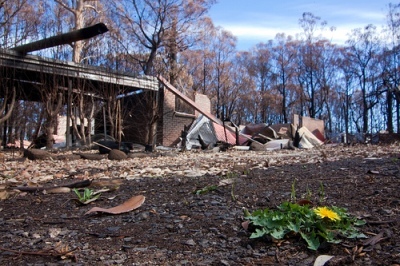 Neil Creek, a Melbourne photographer, was invited into the town of Kinglake [^]. He has the story of his visit, photos and some details of how the town was affected, as told by a local, on his blog. Neil has also written an article on the Digital Photography School site [^], called “Photographing a Tragedy [^]“. The post emphasises the need for respect and tact in this situation, and fills in more of the Kinglake story.